I wasn't sure I liked Provincetown on the first day I was here. I hadn't expected the crowds in the center of town or the jams of pedestrians, bicyclists, and cars on the narrow streets. But now I can't wait to come back. There actually is some mystical power to this place. There is plenty of quiet and beauty, and even the crowds are fun, though I think if I lived here (a fantasy that has already crossed my mind), I would probably get as sick of them as I do of the crowds in the center of the neighborhood where I live. I've seen three celebrities on the street so far: him and him (who I see all the time on the street at home because he lives around the corner) and Lea Delaria. I shook her hand, and D. and I saw her perform that night. She has an engaging personality and an incredible singing voice (I saw her in Wonderful Town on Broadway five years ago), but her comedy is kind of a poor woman's Margaret Cho, in my opinion. It's an easy kind of humor -- counting on laughs by saying the word "fudge" in a gay resort town -- not especially sharp or wise. D., who has seen her show before, says she seemed to be concentrating more on her music than her comedy writing this time around (about half the show is music). And she's one of those people who are a pet peeve of mine, whether in performance or in daily life: those who laugh at their own jokes. 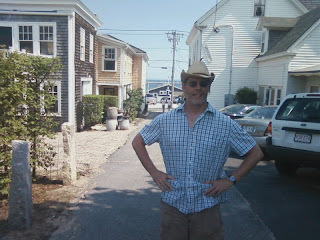 D. in my "beach cowboy" hat. It was meant to be his. 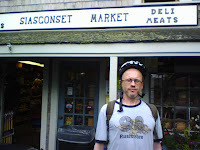 We had a fun bike ride across Nantucket yesterday; we'd taken the ferry there for the day. It's a beautiful island, full of Martha Stewart houses and Martha Stewart people. But we wondered what there is to do there if you don't have a bike. Play golf, I guess. Have cocktails. Buy a new tennis dress. 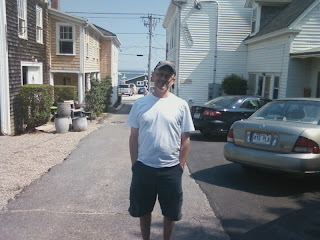 I much prefer Provincetown, with its eclectica of people, places, and things. 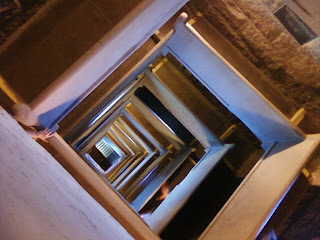 A view on the way down from the top of the Pilgrim Monument in Provincetown. Seven years ago, I wrote an essay about my parents. I sought publication to no avail. Then my boss expressed interest in publishing it, and it sat languishing for years until it started to become outdated. Now that they're no longer living in their home of 50 years, it's completely outdated, so I withdrew it. I'm posting it here (without its title -- not the title of this post, by the way -- because I might also put it on my writing site under my own name). The invitation is always theirs, though I sometimes do the actual brewing. Dad likes straightforward black tea, not even of especially high quality -- a store brand will do. If I’m making it, though, I’ll root around in the cupboard for some loose tea or Twinings bags -- usually left over from a Father’s Day or Christmas present. My siblings and I are always giving him what we consider good teas, but as a Cancer who came of age during the Depression, he’s both set in his ways and thrifty till the end. I’m technically off caffeine, but a polite hello to my system now and then isn’t unwelcome, so I’ll usually have whatever Mom and Dad are drinking, even if it’s a steaming cup of U-Save brand. (I’ve been a vegetarian for several years, too, and it feels like a lot to ask of two people in their eighties to swear off meat and caffeine just because I’ve come calling.) If, say, I haven’t slept well for some reason and I’m worried about another wakeful night, I might make a separate pot of herbal for me and my mother. As long as there’s a wedge of lemon and a generous teaspoonful of honey, then chamomile or peppermint suits her just as well as Earl Grey. I’m strictly a lemon man myself -- I like the tart balance to the usually sweet accompaniments -- but I’ve gotten in the lemon-and-honey habit when I’m over there. The way I look at it is: Mom offers me honey every time -- why not accept? Dad takes his tea with a spoonful of sugar. This surprised me; he used to drink it black, as he did his coffee for all the years he drank that. Come to think of it, Mom always had her coffee without sugar as well, just half-and-half. Does your craving for sweetness become greater the older you get? I end up eating most of whatever Mom and Dad serve with the tea -- an inevitability they take into account when baking or shopping for this unspoken ritual. I don’t have an official standing date with them, and I occasionally miss a weekend visit entirely. At some point during those times -- whether I’m out of town, at the office, or busy with errands -- it’ll hit me with a flash that there’s a box of cookies on the counter or a tray of scones cooling by the stove in the house I grew up in. These days Dad has taken on the role of provider of baked goods, and Mom is happy to let him: one week, donuts from Safeway or Danish from a nearby bakery; the next, homemade brownies or soda bread. Nothing fancy from his own hand -- no pies, tarts, or anything with multiple layers. The recipes he chooses are almost monastic in their simplicity. But they’re made with love, a convert’s curiosity, and the hope that someone else will be there to share them. Dad started to help with the cooking when I was a teenager, but he never baked then. Mom did, and it’s from her that I inherit my own love of baking. Before I was even in school, I’d stand by her side measuring ingredients for spice cake, the page in the cookbook marked for easy reference with a sheet of wax paper; cornflake cookies, the dough so thick with cereal and oatmeal that it slowed the mixer to a whine; or banana bread, to be cut into moist slices and spread with cream cheese. Today, if I’m bored or stressed out at the end of the day, I’ll more likely than not find my way into the kitchen to bake. It’s my first real skill -- learned before riding a bike, before swimming. As with most such skills, my first teacher is with me each time I practice it. The bird feeder outside their kitchen window is crowded with sparrows, grackles, and the occasional mourning dove. When the birds land, seeds spray from the saucer like ice from a skater’s blade. My parents and I talk about the birds -- conversations that, thanks to a change of seed, now actually are about the birds rather than the squirrels. We talk about the new people across the street, who sit out on their front lawn instead of their back, a habit that my parents are as appalled by as if the neighbors had strung a clothes line across the front porch. We talk about the crumbling playhouse from my siblings’ and my childhood; Mom would like to replace it even though it serves little purpose other than to store an old bike, random lumber, and broken furniture. We talk about phone calls from or visits by my two sisters and my brother -- about their kids, jobs, vacations -- and about the news of my own life: a wedding I attended, a high-school friend I ran into, what I made for dinner the night before last. Sometimes we talk in circles -- Mom’s memory is fading -- and often I feel I have little of interest to say (“I gave away three bags of clothes to Goodwill last week!”), but I have to believe they’re glad for the company. I’m not as entertaining as I wish I were -- while there are smiles enough, it’s hard to remember the last time any of the three of us laughed outright. But when words fail -- at least interesting, fresh, unexpected words -- there’s always the tea. Who’d like a second cup? Is this Red Zinger or Lemon Zinger? Help yourself to another slice of cake. The fear of spoiling one’s appetite for dinner, a concept I was raised on, vanishes for all three of us during the handful of hours I’m at their house. Is this what it’s like to be English? I refill Mom’s cup and add more hot water to the pot while Dad replenishes the sweets. I’m welcome to perform some of the hosting duties, just as I’m allowed to let myself in with my own key without ringing the doorbell. My parents would never do either at my house, nor would I want them to. I suppose part of being a grown child on good terms with your parents is having full access to your home of origin, no questions asked. And part of being parents who respect their adult children must be to willingly wear the mantle of guest when visiting them. The reward, when the children come to their house, is to put on the more comfortable costume -- if only briefly -- of parents whose children never left. I sit with them awhile longer, till the clock starts inching up on dinnertime. I’ve found no way to make my departure not seem abrupt. Even if I plant the seed before the fact -- “Well . . . I should think about going pretty soon” -- at some point I have to stand up and say goodbye. That moment always seems to come in the middle of something -- Mom and me struggling with the last, frustrating corner of the New York Times crossword or Dad pulling a book from the shelf to find a poem whose first (or fifth) line one of us saw quoted somewhere. “You can take it with you,” he says, handing me the book. Sometimes I politely turn him down, pleading too much reading I haven’t gotten to at home. More often I let myself see how badly he wants to give it to me -- confirm that I share one of his intellectual passions -- and I take it. I walk to the front door, thanking them for the tea and the hospitality. Mom tells me to drive safely. If it’s dark by now, she might ask me to give a quick call when I get home, just to let them know all’s well. Neither of them drives at night anymore. “Doesn’t driving in the dark bother you?” Mom often asks. I write from Provincetown, Massachusetts. The last time I went on a real vacation was five years ago, and the last time I went on one for more than four days was six years ago. I'm here for a week and a half with D.
I don't know for sure that this blogging revival will take, but I'm trying to get back to myself after months away. Mom and Dad are now both in an excellent assisted-living facility and being well cared for (including by their four children). The last six months have seen big changes in my family, which are still ongoing and about which it's hard to know when I'll find the words. Maybe some will come to me later. Meanwhile . . . I saw Mamma Mia! last night at a drive-in theater on Cape Cod -- the first time I've ever been to a drive-in. The movie is pretty dreadful, mostly because it could have been so much better in the hands of an actual film director. The other problem is that everyone, including Meryl Streep, is at least ten to fifteen years too old for his or her part. (Nearly sixty, Streep plays a woman who became pregnant out of wedlock twenty years ago, which would mean in her late thirties -- not as big a deal even then as the movie would seem to make it out to be.) Then there's the fact that most of them -- with the exception of Meryl Streep and Christine Baranski -- can't sing. Pierce Brosnan --> Harry Connick Jr. Here's one of the many reasons I love Anne Lamott (a real-life woman who got pregnant "out of wedlock"; her well-loved son is now about seventeen). I just finished her book Grace (Eventually): Thoughts on Faith (about as good as the first book in her faith trilogy, better than the second). "Let me say that not one part of me thinks you need to have children to be complete, to know parts of yourself that cannot be known any other way. People with children like to think this, although if you are not a parent, they hide it* -- their belief that having a child legitimizes them somehow, validates their psychic parking tickets. They tell pregnant women and couples and one another that those who have chosen not to breed can never know what real love is, what selflessness really means. They like to say that having a child taught them about authenticity. "This is a total crock. Many of the most shut-down, narcissistic, selfish people on earth have children. Many of the most evolved -- the richest in spirit, the most giving -- choose not to. The exact same chances for awakening, for personal restoration and connection, exist for breeders and nonbreeders alike." * Actually, I would say they don't always hide it so well.